JVC,long been touted as one of the biggest leaders in technology innovation, has introduced yet another remarkable addition to its repertoire of products. The JVC GY-HM790U is now one of the most sought-after camcorder devices on the market. It comes equipped with a 68-pin chassis connector that can connect a wide variety of modules to be attached to the device without additional cable wiring. For instance, the KA-M790 multi-core interface features a 26-pin module that is compatible with both JVC and Sony cables that have a camera control unit. Also, as we had our JVC GY-HM790U review, we found that it can easily be operated or fitted with the KA-790 sled, which is a useful support for the viewfinder, teleprompter, and lenses. When it comes to image quality, the JVC GY-HM790U lived up to our expectations. It utilized a precise 1/3” progressive scan full HD CCD, each for red, blue, and green primary colors. It also features an output full resolution of 720p and 1080ip, allowing operators’ flexibility in terms of resolution and video size. This camcorder is also designed to debut JVC’s ProHD capture technology, which incorporates Adaptive Pixel Correlation Technique and the TRIPLEX Offset Technology. These contribute to a more accurate footage compared to those captured by other camcorders with large image sensors. Another impressive feature we found from our JVC GY-HM790U reviews is its variable frame rate recording. The camcorder can allow up to 720p 35Mbps mode. However, operators have the option of setting the recording to a different frame rate than the playback rate. Essentially, this gives users the freedom to record in slow or fast motion. We found this feature immensely clever for a handheld camcorder. The GY-HM790U has an additional 14x Canon KT 14×4.4KRSJ HD lens, with superb optics that is commonly found in more expensive HD lenses. For us, this was a convenient little addition that made the camcorder even more of a worthy investment. The lens itself had an impeccable lateral and longitudinal chromatic aberration which is exceptional for full 1920 x 1080 imaging and shooting. What’s even more convenient to operators is the fact that the HM790U allows other detachable lenses such as Fujinon lenses and Canon zoom lenses. This expansion of different lens options is no doubt a good investment for any shopper. The camcorder itself features an “image flip” functionality that can correct any inverted image produced by prime lenses. For us, it virtually saved the need to digitally correct the footage on a computer. The JVC GY–HM790U weighs only around 8.2 lbs., including detachable accessories like lenses, viewfinders, microphone, and battery. 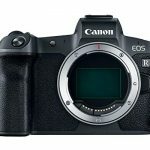 This is perhaps one of the lightest high-end cameras out on the market. Our initial reviews also found this device to be very comfortable on the shoulders, assuring operators that it can take stable, focused, and accurate shots. Contrary to other bulky “handheld” models out there, the camera handle of GY-HM790U was designed to be easy and ergonomic. It was essentially built for tough on-the-field projects as well as studio settings. Lastly, the camcorder comes with a high-resolution viewfinder. A rugged new design of a .45-inch 1.22MP LCOS panel, this will display images that have 5 times better resolution than the displays of conventional viewfinders. This camcorder can be classified as ‘full HD’. It has interchangeable lenses, a portable build, and convenient controls appropriate for both pros and amateurs. 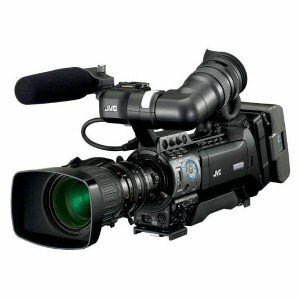 Overall, the JVC GY–HM790U is a solid, innovative and an excellent broadcast camera.